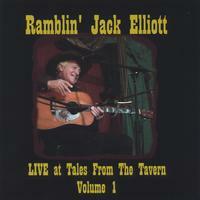 Ramblin' Jack Elliott (born Elliott Charles Adnopoz, August 1, 1931) is an American folk performer. Originally from Brooklyn, New York, Elliott grew up in a Jewish family and had always wanted to be a cowboy, inspired by the rodeos he attended at Madison Square Garden, during his youth. Pressured by his parents to follow in his father's footsteps and become a doctor, Elliott resisted and instead ran away from home (at the age of 15) to join the then-famous J.E. Rodeo, the only rodeo ranch east of the Mississippi River. The rodeo traveled throughout the Mid Atlantic and New England states. Although he was only with the rodeo for three months (before his parents tracked him down and he was sent home), Elliott was exposed to his first singing cowboy, a rodeo clown who played guitar and banjo and sang songs. Returning home, Elliott taught himself to play guitar and started busking for a living. Eventually he hooked up with Woody Guthrie and lived with him as a kind of student and observer. With banjo player Derroll Adams, he later toured Great Britain and Europe and had a lasting effect on the music scene there. By 1960, he had made three folk albums for the British label, Topic. Playing in the small clubs and pubs of London by day, he would then take his act to the smart, West End Cabaret night clubs. Upon arriving back in the U.S., Elliott discovered he had become well-known within the folk scene. Elliott's greatest influence was Woody Guthrie. Guthrie's son, Arlo, has said that because of his dad's illness and early death, he never really got to know him. Arlo acknowledged that he learned his dad's songs and musical style through Elliott. Elliott's guitar style and his mastery of Guthrie's material made a big impact on Bob Dylan while a student at the University of Minnesota. (Dylan paid tribute to Elliott's music in Chronicles, Vol. 1, pp 250-252.) When Dylan reached New York, he was sometimes referred to as 'son of Jack Elliott', due to Elliott's way of introducing Dylan's songs with the words: "Here's a song from my son, Bob Dylan." While Dylan rose to prominence through his song writing, Elliott continued as an interpretative troubadour, bringing old songs to new audiences in an idiosyncratic manner. Elliott also influenced Phil Ochs, and played guitar and sang harmony on Ochs' song "Joe Hill" from the Tape from California album. Elliott appeared on Dylan's Rolling Thunder Revue and played "Longheno de Castro" in Dylan's Renaldo and Clara. Jack Elliott's style is distinctive in its use of excellent guitar technique matched with laconic, humorous storytelling and an emotional intensity in the singing. Elliott's nickname is due not to his travel habits, but rather to the countless stories he would relate before answering the simplest of questions. Folk singer Odetta claims that it was her mother who gave him the name by remarking, "Oh Jack Elliott, yeah, he can sure ramble on!" He was famously parodied in on the BBC in the 1960s by Kenneth Williams as Rambling Syd Rumpo who was a recurring character on Round the Horne. His claims of authenticity as a folk artist (despite being a Jewish doctor's son from New York City) and disparagement of other folk artists were also parodied by the Folksmen (Christopher Guest, Michael McKean, and Harry Shearer) in A Mighty Wind in the name of their "hit" album Ramblin'. Jack Elliott's first recording in 20 years, "South Coast", earned him his first Grammy in 1995. He was awarded the National Medal of Arts in 1998. Ramblin' Jack's long career and strained relationship with his daughter Aiyana were chronicled in her 2000 documentary, "The Ballad of Ramblin' Jack". At 75, he has recently changed labels and released "I Stand Alone" on the Anti- label, with an assortment of guest backup players including members of the Red Hot Chili Peppers; again, an idiosyncratic collection of little-known music delivered with humor and intensity. He is on record as saying his intention was to title the album "Not For The Tourists" because it was recorded in response to his daughter's request for songs he loved but never played in concert. When she asked why he did not play them in public, he replied "These songs are not for the tourists".